A second entry, from Timothy Abraham. 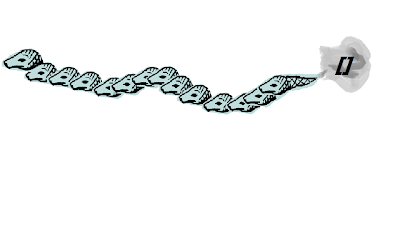 I have created this animal which represents a list, it's a snake whose tail consists of heads, in the end you'll see that the snake releases air with the empty list in it, this symbolizes the empty list, because the empty list is like air it is something but it is also nothing. An elegant animation by Pedro M Cruz. Spotted via Boing Boing. I have just remembered your request for a picture of a creature, with lots of heads and a tail. The closest to this I was able to come up is a shark eating another shark eating ... etc. Let's think of shark's head as an element in the list. 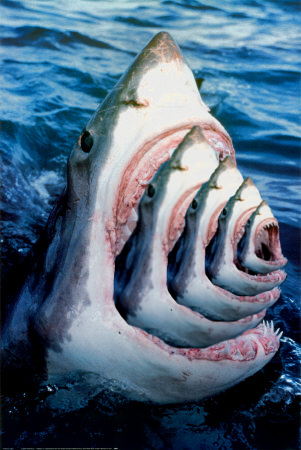 This way one could think of ":" as shark teeth 'connecting' to other shark (Cons even look like a mark from a bite!). Then the head of the smaller shark is the head of new list, and the tail of the list is the bigger shark. If we assume that water is , then it also works in the bottom case with no elements in the list (no sharks) - only water. And water swallows the shark up to it's head so this also work (shark : ). 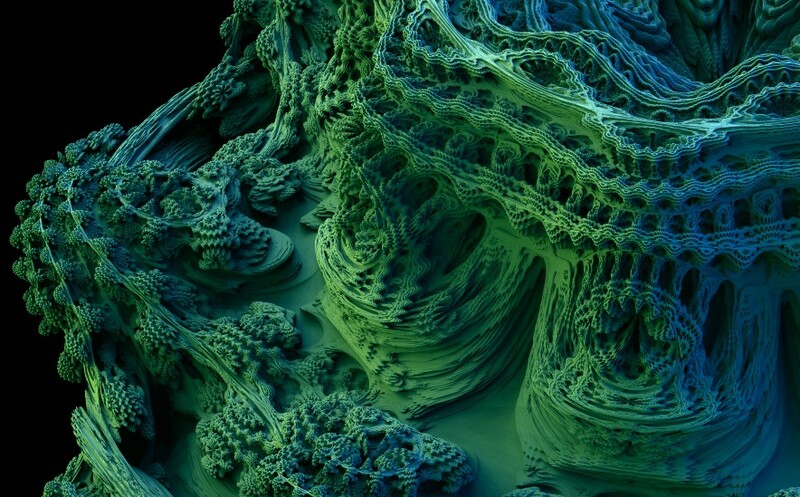 The quest for the 3D-analogue of the Mandelbrot curve, with some remarkable photos. Passed on by my colleague Bob Fisher, who knew of my work with students on interactive application, Mandelbrot Maps. Thanks, Bob! I've just listened to the best defense of this thesis that I've ever heard, courtesy of Bob Constable. A paper on the same topic of his is linked above. Other relevant papers on the same subject are Alan Bundy's Computational Thinking is Pervasive and Jeanette Wing's Computational Thinking. I was also fortunate to see Jeanette Wing address this topic in her recent OOPSLA keynote. In the question period, I mentioned Dijkstra's quote, and also my interpretation of it. I believe that in his usual style, Dijkstra was exaggerating. I think there are two precedents: the invention of writing and the discovery of mathematics. Computing give us, with prose and mathematics, a third way to describe our discoveries.